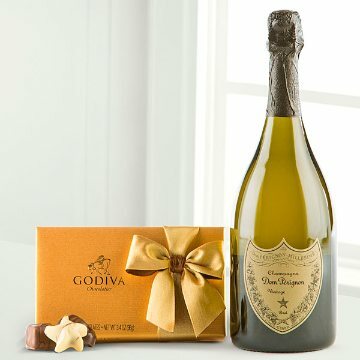 Dom Perignon and Godiva® are legendary brands that have set the standard for combining luxury with heavenly taste. Known for their artful approach to perfecting vintage Champagne, Dom Perignon is the ideal pairing for Godiva® chocolates. Beautifully packaged, the Godiva® 8-piece Gold Ballotin includes a variety of milk, dark, and white chocolates with classic Belgian fillings such as silky ganaches, creamy pralines, rich caramels, fruits and nuts. Due to the popularity of this gift, vintages sometimes sell out. Should this happen, we will always substitute with the current vintage. Pursuant to state laws in New York, gifts that contain both food and wine will be sent in two separate packages. This gift includes the follwing: Dom Perignon Champagne (750 ML), Godiva 8-piece Gold Ballotin Assorted Chocolates 3.4-oz. If any substitutions are necessary, they will be made with items of equal or greater value. Please note that this gift is only available for purchase and receipt by persons over 21 years of age.